The Bharatiya Janata Party (BJP) is considering the upcoming Lok Sabha election as a “semi-final” contest against the Trinamool Congress (TMC) in West Bengal before taking on Mamata Banerjee’s party in the 2021 state polls. After humble beginnings in the 1980s, the BJP had a minor say in the politics of West Bengal as recent as 2014, with one or two wins in the past Lok Sabha elections and a marginal vote share. But with the fall of the Left Front government, the scenario suddenly looked brighter for the BJP. Not only was the party able to tap the otherwise withering vote share of the Left Front, but it also started making deeper inroads into the Hindi-speaking and the tribal belts of the state, and focussed on increasing the membership base, which now stands at over 4.3 million. “We had been able to tap the vote bank of the Left Front. Like the Left, the BJP is a cadre-based party, although the ideology is vastly different,” a BJP leader said. 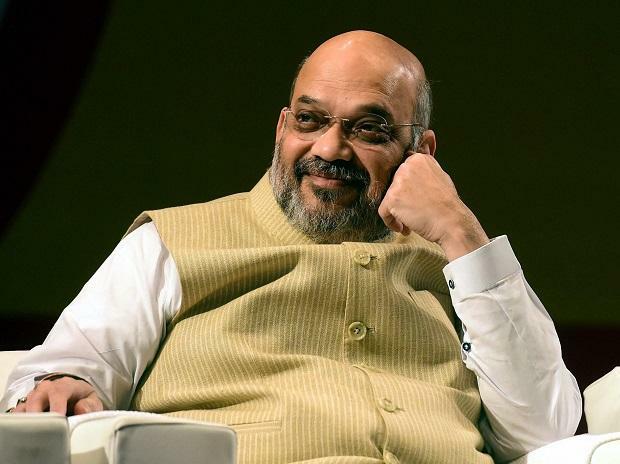 He said the BJP earlier wasn't considered an alternative or a force to reckon with in the Left-ruled West Bengal as there was little support for its ideology among Bengalis, but now the party has come of age and presenting itself as the primary opposition party in the state. Though the party has only two MPs in the Lok Sabha from West Bengal, its influence over the state politics is far greater, political observers said. “The Left Front and the Congress will definitely lose vote share since they have failed to reach a seat-sharing deal, and the TMC and the BJP stands to gain the most from it. I think the BJP will be able to increase its vote share to 33-35 per cent this time,” political expert Biswanath Chakrabarty said. In the 2014 general election, the BJP had an 18 per cent vote share, an 11.86 per cent increase as compared to the 2010 general elections. The Communist Party of India (Marxist) or CPI(M) lost 10.1 per cent votes in the same election and won only two seats as against its previous tally of 15. By 2018, the BJP had become the second-most influential party in the state after finishing second in the panchayat elections, where it bagged 5,779 seats. More importantly, the party’s candidates were elected at the gram panchayat level in every district of the state. The BJP won 11.9 per cent of the total seats at the gram panchayat level, while the Congress and the CPI(M) emerged victorious in only 2.2 per cent and 3 per cent seats, respectively. Also, in the 294-seat Assembly, the party sent three members; its best tally ever. In 1952, its predecessor Bharatiya Jan Sangh had won nine seats. Chandra Kumar Bose, vice-president of the BJP’s West Bengal unit, says the party’s success in attracting the masses rests primarily on three pillars — a perception that it has a pro-industry approach in its policies which will lead to re-industrialisation of the state, and hence more jobs; second, the state stands to benefit if more members of parliament as well as of assembly are from the ruling faction, which will be in power at the Centre. The third factor, according to Bose, is the party’s growing presence among the Bengali Hindus, who account for 48 per cent of the voters in the state. “Mamata’s appeasement policy hasn’t gone down well with Hindus in the state,” he said. While officially, the party has projected a win in over 20 Lok Sabha seats, of the total 42 in the state, party insiders expect the BJP to take the TMC head-on in 10-12 seats. 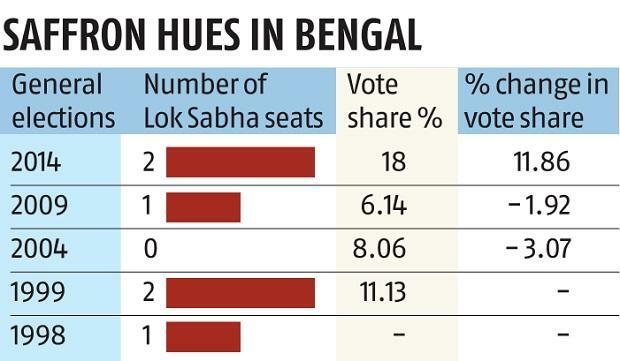 These seats are primarily in north West Bengal, border areas and constituencies dominated by the tribal minorities. Apart from increasing its membership in the state as well draw in admirers, the BJP is increasing its presence in border districts of the state like Alipurduar, Cooch Behar and Malda. These areas have witnessed a huge influx of illegal migrants from Bangladesh. “The Lok Sabha elections will be the semi-final for the BJP in Bengal before the final showdown in the 2021 Assembly elections. The TMC has been losing support, its leaders are switching over to other parties and people want an alternative,” Bose said. Two Trinamool MPs had recently switched over to the saffron party.